This structural problem has many causes. It could be a result of poor building materials or techniques used during the time when the home was being built. Or it could be a result of unfavorable soil conditions around the home. This includes soggy soil from a wet spring or fall, or it could be from soil that wasn't properly backfilled. This can create voids or gaps beneath the home that it will eventually start to sink into. 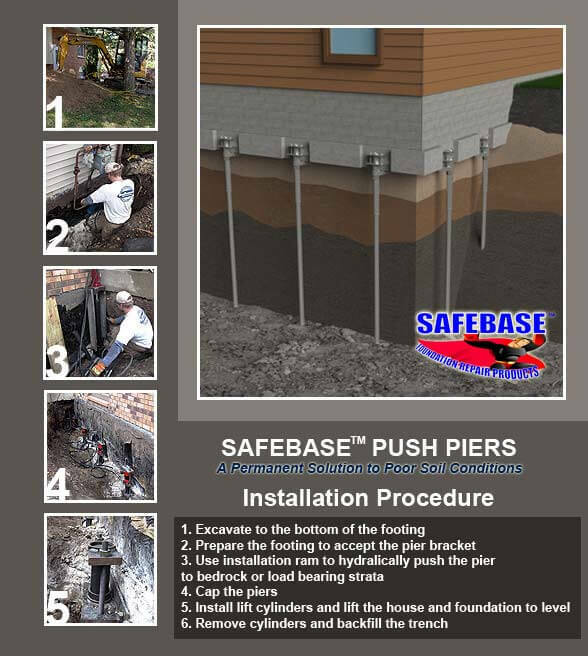 To take care of the problem, St. Louis Basement Pros can install helical and push piers from SafeBasements™. These are designed to stabilize and/or lift foundations by transferring the weight of the home from unstable soil to the suitable more stable soils below. This is achieved by hydraulically driving push pier sections through a bracket (which is attached to the foundation footing) until they reach stable soil. Stable soils are determined by load testing every pier as they are being installed. They are hydraulically driven until they reach the desired resistance, giving them a safety factor of two to three. These can be installed in all weather conditions, and installation is easier due to only needing small equipment for install. They install without costly and messy excavation, and allow concrete to be poured immediately after being placed in the ground. No reviews were found for this service / location. View our other reviews by clicking the button below.